When it comes to solar energy pros and cons, we've heard it all: It's for hippies, it's too expensive or it doesn't work. Yet more solar energy systems are being installed on homes and businesses than ever. We explain some FAQs about the pros and cons of solar energy. 1. Solar is a proven technology. The history of photovoltaic solar power began with scientific experimentation during the late 1800s. The first PV silicon cell capable of converting the sun’s energy into power that could run electrical equipment was introduced in 1954, and by 1983, worldwide PV production exceeded 21 megawatts. Currently there are 47.1 gigawatts of total solar capacity installed nationwide, so it’s safe to say solar is a proven technology and that its adoption as a source of clean energy will continue. 2. Solar works in many climates. 3. Solar is more affordable than ever. Businesses, schools and government entities may also qualify to use federal investment tax credits or accelerated depreciation for commercial solar panels. 4. Solar energy benefits the whole electricity grid. 5. Solar panels have a long lifespan. Solar panels are quite durable and can withstand even harsh weather conditions, including the impact of hail up to one inch in diameter. Only 1-in-20,000 SunPower panels are ever returned.4 Check out this video about why SunPower panels are so long-lasting. 7. Solar panels can increase home values. 8. Solar is a nonpartisan energy source. Solar isn't just for hippies. It is being embraced by people across the entire sociopolitical spectrum. Homeowners covering all demographics; Fortune 500 and oil companies; and governments and schools across the world continue to install solar energy systems. Mainstream banks are financing solar. Progressive solar policies have been driven at the state level by Republicans and Democrats alike. The environmental benefits of solar power are undeniable, but it’s being embraced widely because it makes good financial sense. 1. Solar doesn’t work at night. Some people interested in solar might wonder if, by going solar, they can live completely off the grid. This isn’t realistic in most applications of solar technology. While many solar companies, including SunPower, are investing in home battery storage solutions, the batteries are not quite yet a widespread option for most homeowners. Solar energy is mostly used in real time, with any excess delivered back to the conventional utility grid. Solar households rely on utility grids for power at night and in other situations where sunlight is limited. However, for commercial solar users such as schools, government facilities and businesses, this is less of a limitation thanks to SunPower’s solar + storage solutions. 2. Solar panels are not attractive. Beauty is in the eye of the beholder, but today’s solar panels are generally sleek, compact and fit snugly against the roof. We take particular pride in our SunPower Equinox™ home solar system. With its minimalist design, we’ve eliminated unnecessary hardware and utility boxes on exterior walls. 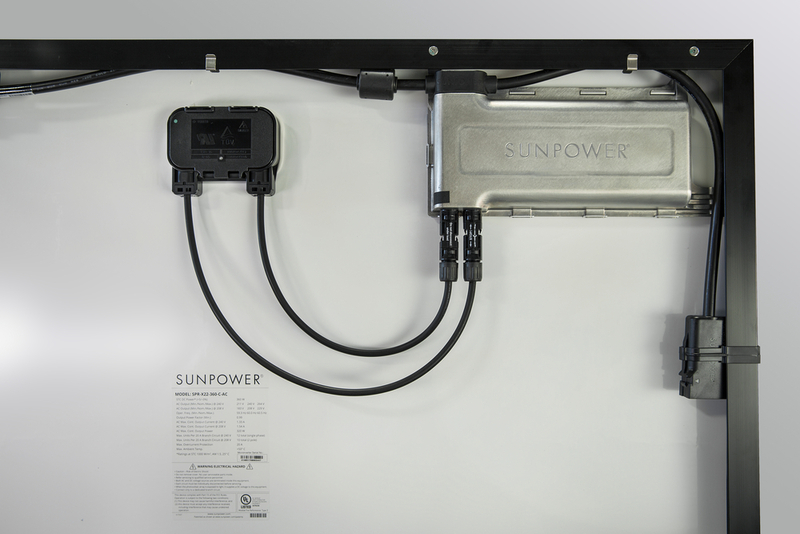 The inverter box is hidden behind each panel, which looks more attractive AND maximizes the amount of power your system can generate. Our proprietary InvisiMount® frame is nearly invisible, so the panels appear to float just above the roof. Buyers also have the choice of our SunPower® Signature™ solid black solar panels, which have a distinctively elegant appearance. 3. You can’t install a home solar system yourself. While you might think that not being able to install solar yourself is a disadvantage, letting the experts handle it turns going solar into a very simple process. (See our Five-Step Guide.) Professional solar installers have expertise designing solar systems for homes and businesses, ensuring the system captures the maximum amount of sunlight available and saves you the most money on your electric bill. SunPower dealers know local permitting rules, so they can make that process go as smoothly as possible, and of course someone with electrical experience needs to handle the wiring. You can get a free consultation to find out what it will take to switch your home or business to solar energy. 4. My roof isn’t right for solar. It’s true that solar won’t work on every building, depending on shading and roof orientation. To make the most out of your solar system, it helps to have plenty of roof space that gets a lot of sunshine. But solar companies are used to working with these issues, and you'll find out in your free consultation how a solar system will best fit on your property. It’s worth noting that because SunPower solar panels are the most efficient you can buy, you need fewer of them on your roof, so you can generate more energy in a smaller space. That high efficiency also means our panels are better at generating more energy in low-light situations, such as shading, so if your roof isn’t fully in the sunlight, your system will still be making electricity. And, because our inverters are behind each panel, if one panel is in the shade, the others will be able to pick up the slack. 5. Solar hurts the environment. Solar panels are a manufactured product, and — as with any building processes — there is an environmental impact, from the chemicals used to make the panels to the transportation and beyond. However, solar is one of the least-polluting forms of energy generation available. And, SunPower builds the most environmentally friendly solar panels possible. We raise the bar for environmental and social sustainability through our "Beneficial by Design" philosophy that aims to be a regenerative force on the environment and society. From our DC panels that have achieved Cradle to Cradle CertifiedTM Silver recognition, to our Light on LandTM program, we are proud to lead the industry in environmental stewardship. 5. Not all solar panels are high quality. It’s true there are a wide variety of panels on the market with varying levels of efficiency, durability, reliability, output and design. We strongly recommend that you do some research before selecting panels for your home or business, considering the impact of each of these factors on your system’s output and the long-term cost savings you can expect. It’s worth it to invest in top-quality solar panels. After all, what other technology around your home or business do you expect to still be working for you three decades from now? We’re so confident in our panel quality that we offer a best-in-industry 25-year Power and Product Warranty for home or commercial use. 1 SunPower Module 40-Year Useful Life," SunPower white paper. 2013. Useful life is 99 out of 100 panels operating at more than 70% of rated power. 2 For qualified customers in select locations where leases are available. 3 Tax credits and local incentives vary and are subject to change. SunPower does not warrant, guarantee or otherwise advise its partners or customers about specific tax outcomes. Consult your tax advisor regarding the solar tax credit and how it applies to your specific circumstances. Please visit the dsireusa.org website for detailed solar policy information. 4 "Fraunhofer PV Durability Initiative for Solar Modules: Part 2". Photovoltaics International, 2014. 5Source: Hoen, B., Adomatis, S., Jackson, T., Graff-Zivin, J., Thayer, M., Klise, G., & Wiser, R. (2015). Selling Into the sun: Price Premium Analysis of a Multi-State Dataset of Solar Homes. Based on an analysis of homes with and without solar systems in 8 states from 1999 through 2013. Actual impact on home values will vary.